Regular maintenance is the greatest way to avoid major repairs, and Ressler Motors is the best place to trust your vehicle. Our mechanics and service technicians are surrounded in years of experience under the hood, and they take on each vehicle as their child. Don’t settle for less with your vehicle, bring it to Ressler Motors. Face it, your vehicle isn’t going to last forever, but by following your manufacturers suggested service schedule, and by bringing your vehicle to a high quality facility like Toyota of Bozeman, you can extend the life of your vehicle. The service facilities at Ressler Motors are top notch, with highly qualified technicians. Whether you are having your new import (Toyota, Subaru, Honda, etc.) serviced at Toyota of Bozeman Service Center, your domestic (Chevrolet, Cadillac, Ford, etc.) serviced at the GM Service Center or almost anything at Toyota of Bozeman, you can be rest assured that your vehicle is in good hands. 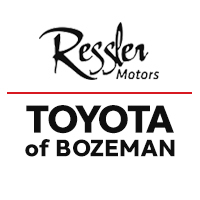 With Toyota of Bozeman, you get a 120 day advantage on top of your oil change, transmission flush, coolant service, brake flush and more. You get 120 days of Emergency Roadside Assistance, Rental Car Coverage for mechanical breakdowns and Road Hazard Tire Protection*. What this means to you is confidence in your vehicle. You know that if anything goes wrong, Ressler Motors has you covered. So stop bringing your vehicle that isn?t there for you if something goes wrong. Take the next step in vehicle maintenance: Ressler Motors. * Starting at this price. Prices vary depending on vehicle specifications.